© Petróczi et al. ; Licensee Bentham Open. Benefits of exercise for HIV-infected persons have been documented, although in clinical practice, diminished adherence to exercise limits the effectiveness of this auxiliary treatment. Exercise intervention studies carry the caveat that the results are limited to volunteers with good compliance and completion profiles. This study aimed to identify characteristics contributing to adherence vs non-adherence to prescribed supervised 10-week 75-minute aerobic and progressive resistance exercise programme in a clinical setting that requires twice-weekly attendance at the physiotherapy gym. This observational study was comprised of 11 males and 11 females, physician-assessed, HIV seropositive patients referred to exercise programmes in a tertiary multi-disciplinary outpatient service for HIV patients at an urban Teaching Hospital in London (UK). Measurements taken prior to the exercise programme were used as dependent variables and include CD4 count, fitness level, flexibility and perceived physical-, emotional-, functional- and psychological- well-being. Attendance records were categorised into a dichotomous independent variable of adherence based on a natural break that occurred at 8/20 attended sessions. Prior-to-treatment differences in perceived physical, functional and psychological well-being exist between adherent and non-adherent patients, but no differences were found in age, CD4 count or fitness level. Perceived well-being explained 55.7% of the variances in attendance. Gender and reason for referral appear to be independent of adherence, whereas ethnicity may play an influential role. Perceived well-being appears to differentiate between adherent and non-adherent patients. Further studies are required to investigate other psychological characteristics and barriers to maintaining exercise. Keywords: HIV patient, exercise programme, adherence.. The motivating and deterring factors regarding adherence to medical treatment in HIV-infected subjects are complex [1-3] and socio-behavioural research has been applied in numerous attempts to identify patients with ‘high-risk’ profiles. These attempts often rely on ‘predictors’ that are relatively stable (i.e. personality factors) or beyond the patients’ control (e.g. barriers to care or medication, complexity of treatment, costs of medication or required co-payment) [4, 5]. While socioeconomic factors do not seem to influence adherence significantly , severity of the disease and perceptions of treatments , and perceived quality of life  appear to be strong predictors of adherence to medical treatment. Modifiable factors and the usefulness of behavioural intervention have been extensively assessed [9-13]. Pharmaceutical treatment for HIV-infection is often complemented with adjunctive treatments such as alternative therapies [14,15], psychological interventions  or physiotherapy . Numerous studies have reported the benefits of exercise for the physical and psychological well-being of HIV seropositive patients [18-25]. The recent meta-analysis presented by O’Brien et al included ten randomised controlled clinical trials over a sixteen year period and indicated that progressive resistive and/or aerobic exercise may lead to weight gain and increased arm and thigh girth in participants . Earlier studies reported that exercise may lead to increases in: psychological well-being, functional aerobic capacity, quality of life indices, cardiovascular profile, body cell mass and strength with decreases in body fat [19-25]. While no direct health benefits were observed, the CD4 cell count of patients adherent to exercise programmes increased by 13%, whereas that of the non-adherent patients decreased by 18% . This study was conducted before the introduction of Highly Active Antiretroviral Therapy (HAART) and although significant, the difference may not have clinical impact. Whilst many of the studies reflected the benefits of six to twelve weeks of exercise, it is notable that caution is required as several of these studies were conducted prior to the introduction of the latest predictive and actual therapeutic approaches including HAART . Furthermore many reports carry the caveat that the results are limited to the participants (motivated volunteers) with good compliance and completion profiles. In real life, adherence to exercise and to medical treatment may fall well below desired levels and hinder the effectiveness of such programmes. In clinical practice, non-adherence to medical treatment and/or rehabilitation is typically related to low self-efficacy or depression [9,28-31] but a recent review into the usefulness of health behaviour models to explain and promote adherence to treatment concluded that there was very little evidence supporting these theories relating to adherence and called for future research . Despite the growing body of research aimed at determinants of adherence to antiretroviral treatment, adherence to exercise among HIV seropositive patients is an under-researched area. Adherence research among HIV infected persons has been limited to adherence to drug regimes and carries limitations to a varying degree depending on the method used . Adherence has been identified as a major barrier to benefitting from exercise-based treatments, however, these studies have focused on exercises after heart failure, injury or chronic conditions such as rheumatoid arthritis, low back pain or cystic fibrosis; and, typically looked at sustained adherence to home- or community-based exercise programmes [33-37]. Therefore, the aim of this report is to present an analysis of patients with known physical and psychological characteristics to explore associations with non-compliance in prescribed exercise regimes. Results from this observational study will help to guide researchers to develop comprehensive research to identify factors contributing to non-adherence and inform health care professionals to devise strategies to improve adherence to exercise. This observational study utilises data collected for clinical purposes in an established intervention programme. The intervention is a 10 week aerobic and progressive resistance exercise programme at St. Thomas’ Hospital London, an urban Teaching Hospital. It forms part of the tertiary multi-disciplinary service for HIV patients. The programme is led by a physiotherapist and consists of twice weekly attendance at the St. Thomas’ Hospital physiotherapy gym. The subjects in the case study were participants in an established exercise programme. As part of this service, patients have their cardiovascular (CV) risk evaluated yearly by their treating physician in accordance with The British HIV Association (BHIVA) guidelines . Patients are also routinely questioned about body shape changes. Patients identified with significant CV risk are assessed at a multidisciplinary lipid clinic. Joint dietetic and physiotherapy lifestyle management advice is commenced as part of this clinic. Where exercise intervention is indicated, patients are offered general exercise advice by the physiotherapist and are referred either directly to community based gym programmes or to the hospital’s supervised 10-week aerobic and progressive resistance exercise programme. An identical pathway is offered for patients referred to the service to optimise muscle bulk, general strength, mood and fitness following illness. Routine referral to local community gyms or other physical activity programmes, which are convenient for the patient, follows the completion of the programme. Patients are required to be medically stable or actively well to participate in the programme. This study focuses on adherence to the hospital’s supervised 10-week aerobic and progressive resistance exercise programme. We analysed, in retrospect, anonymised measurement records of 30 consecutive physician-assessed, HIV seropositive patients referred to the hospital exercise programme for increased cholesterol, blood pressure, body weight; reduced muscle bulk, exercise tolerance, mood, lipodystrophy (central adiposity/lipohypertrophy) or the combination of these symptoms. The use of the anonymised data for this research received ethical clearance from the Guy’s and St. Thomas' Hospital NHS Trust. Measurements taken at the initial session of the programme were used for analysis. Patients are on a rolling rota (i.e. there is no set ‘group start date’). Twenty-two patients attending the clinic between January and May 2008 were included. The sample consisted of 11 males and 11 females with the mean age of 41.52 ± 7.12. Most patients (19 of 22) were on HAART treatment with CD4 counts above the customary cut-off value of 250 cells/mm3 (mean = 529.82 ± 246.26, median = 510). A normal count in a healthy, HIV-negative adult can vary but is usually between 500 and 1500 cells/mm3. BHIVA treatment guidelines 2008 now recommend that initiation of highly active anti retroviral therapy should be recommended in all patients with a CD4 count <350 cells/ mm3. A group of six to ten participants are supervised by a physiotherapist and technical instructor in twice weekly 75 minute sessions for ten consecutive weeks. All patients have a pre-organised exit strategy after this ten week session which links into other locally available physical activity programmes. The exercise sessions follow the recommendations made by the American College of Sports Medicine . In line with the programme described by Fillipas et al, a session starts with five to ten minute warm up followed by 20-30 minutes of cardiovascular exercise on either a crosstrainer, treadmill or exercise bike . The intensity of the cardiovascular exercise ranges between 60-80% maximum heart rate dependent on the patient’s perceived effort. Patients are encouraged to progress the time spent exercising as tolerated. Heart rate monitors (Polar T31 chest belt transmitter) are used approximately every fourth session to monitor exertion levels. A pulley based multigym is used for weight training. Major muscle groups are targeted by performing latissimus dorsi pulldown, chest press, shoulder press, leg press and tricep and bicep pulley exercises. Individualised training, such as abdominal or buttock exercises, is also provided. The exercises are dosed at 70% of one repetition maximum (1RM) for 1-3 sets of 8-12 repetitions. Patients are encouraged to experience some degree of muscle fatigue by the final set. Patients complete each session with a standard stretching regime. Patients self-record exercise dosing during each session and return the information to the physiotherapist at the end of each session. Patients were also routinely encouraged to complete one or two further independent sessions of 20-30 minutes cardiovascular exercise, such as brisk walking, per week. In addition to age, gender, ethnicity and reason for referral, measures taken before the exercise intervention used for this analysis include: CD4 count (cells/mm3), fitness level (modified Harvard step test) , flexibility (sit and reach test)  and perceived physical-, emotional-, functional/global-, social- and cognitive well-being using the revised Functional Assessment of Human Immunodeficiency Virus Infection (FAHI) quality of life test, version 4 . The modified Harvard step test uses 30.5cm height and measures heart rates at 1 minute, 2 minutes and 3 minutes instead of the total beats per 30 seconds in each recovery time period. The FAHI test measures the overall broad perception of quality of life . In addition to health and physical functioning, the FAHI encompasses aspects of emotional-, social- and cognitive well-being. The FAHI scores can be grouped into five subscales (as above) or used as a measure of the overall well-being, with higher scores reflecting a perceived better quality of life. Attendance was recorded and used for categorising patients into the adherent vs non-adherent groups. In the absence of pre-defined adherence criteria, cluster analysis was used to establish a naturally occurring division between ‘adherent’ and ‘non-adherent’ patient. 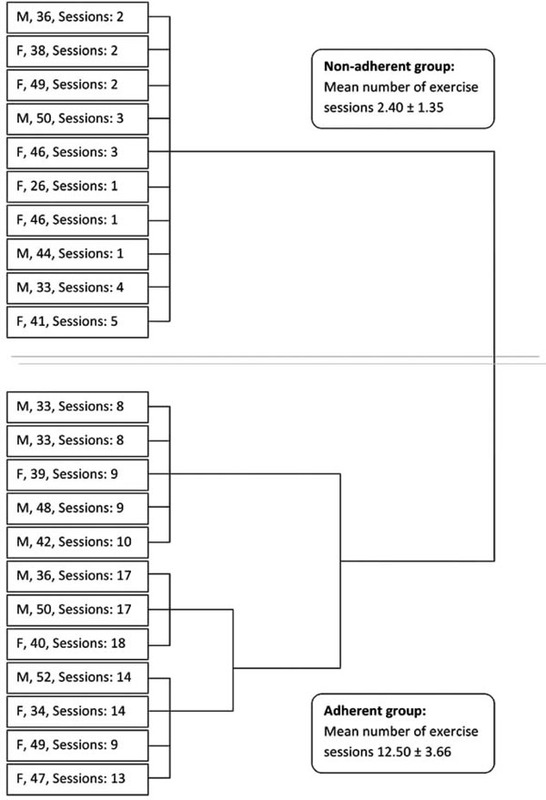 Using hierarchical clustering with Ward’s method and squared Euclidean distance, patients were categorised into two distinct groups of 10 non-adherent and 12 adherent patients using a naturally occurring break between sessions < 5/20 and > 8/20 (Fig. 1). Dendogram distinguishing adherent and non-adherent subjects (Ward method with squared Euclidean distance) of adherence to the exercise programme (defined as the number of exercise session attended). Ethnic distribution in the sample (top table) and in the adherent (left graph) and non-adherent (right graph) groups. Based on cluster analysis of the attendance records, adherence was operationally defined as attending more than 8 of the prescribed exercise sessions. This adherence criterion reflects a reasonably sustained behaviour (i.e. commitment to exercise that tends to develop after the first 5 weeks)  but it is acknowledged that this falls below those considered ‘acceptable’ (> 50%)  or ‘good’ (> 75%) in exercise intervention studies [46-48]. Using the ‘good’ commitment to exercise criterion, only 3 of the 22 patients were adherent from the small cohort of this observational study. This highlights the striking discrepancy between the real life situation and controlled exercise intervention studies. In reality, patients are referred to exercise and are likely to exhibit a wide range of motivation or determination to comply with the prescription, whereas in clinical intervention studies motivated volunteers are recruited and selected for the exercise programme. As stated earlier, the driving force behind this study was to i) draw attention to the gap between clinical controlled trials and real life, which hinders the relevance of any positive effect derived from controlled studies to real life situations, and ii) identify physical, psychological and socio-demographic characteristics that distinguish between adherent and non-adherent groups. Measurements are expressed as means and standard deviations with normality tested with Kolmogorov-Smirnov tests with Lilliefors correction. All p values were > .20 but CD4 (p = .007). Pre-exercise measures of adherent and non-adherent patient groups were compared using independent t-tests (Mann Whitney non-parametric equivalent for comparing CD4 counts), whereas exercise effects were investigated using paired sample t-test analyses. Pearson correlations were used to test the relationship between the predictor variables and exercise, as well as for testing interaction effects between the predictors. The predictive power of selected factors was calculated by regression analysis with the Durbin-Watson test for autocorrelation. Chi-square tests were used to compare the ethnic and gender distributions in the sample to those in the adherent vs non-adherent groups. Owing to the small sample size, results from the statistical analyses are conservative (i.e. only the robust differences and/or relationships have reached statistical significance). This limitation was counterbalanced by reporting group means and effect sizes in all measures and analyses. Statistical analyses were performed using SPSS.16.0. Effect sizes were calculated using GPower 3.0 software . For adherent versus non-adherent groups, the difference in the number of sessions attended was statistically significant (t = 8.872, p < .001) with an average of 12.5 ± 3.66 and 2.4 ± 1.35 sessions attended. Adherence was independent of gender (χ2 = 0.733, p = .392). In the adherent group, there were 5 female and 7 male patients; whereas among non-adherent patients there were more female (6) than male (4) patients. Referral reasons (Table 1) show a similar spread in both groups. a Patients may be referred to exercise programme for multiple reasons. The ethnic distributions in the sample and in the adherent and non-adherent groups are shown in Fig. (2). 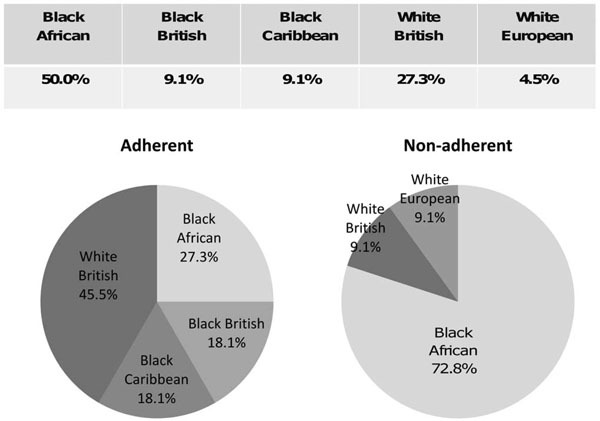 The proportions of black African patients among the non-adherent patients, and white British in the adherent group were significantly higher that they could have been expected from the overall ethnic distribution in the sample (χ2 = 9.839, p = .043). Among those who were classified as ‘non-attender’, the following pattern was observed: 3 patients (30%) attended the initial appointment but none of the subsequent exercise sessions; 3 patients (30%) attended the first 2 sessions only; and 2 (20%) attended the first 3 sessions. The attendance of 2 patients was spread over the 10-week period, with one attended 4 times, always on the same day. It appears that the majority (80%) lost interest, motivation and/or willpower within 2 weeks of starting the programme. Further study should aim to investigate the reasons behind this pattern. Of the three patients with excellent attendance (> 85% of the 20 sessions), two were males and one was female (Fig. 1). Notably their perceived well-being scores were higher than both the adherent and non-adherent groups’ averages, whereas their fitness indices were below both groups’ average fitness indices. Dissecting the FAHI scores of these three patients and comparing to the groups’ averages, the perceived emotional and physical well-being rose considerably above the groups’ averages, causing the overall FAHI scores to be considerably higher than the average. This suggests that the perceived well-being may be more influential than the actual physical fitness level or other physical characteristics when it comes to being adherent to the prescribed exercise. The fact that their fitness indices of all three patients fell below the groups’ averages indicates that these patients are not regular exercisers, hence their excellent adherence cannot be explained by the notion of ‘liking exercise’. Adherent and non-adherent groups were compared on pre-exercise measures of CD4 counts, flexibility, fitness, and physical-, emotional-, functional/global-, social- and cognitive well-being. Owing to the mixed gender groups, strength and weight measures were not compared. The observed differences are shown in Fig. (1), with means, standard deviations, t-test statistics, p-values and effect sizes summarised in Table 2. The observed differences did not reach statistical significance, except for the overall FAHI scores (p = .05). The relationship between the number of sessions attended and the perceived well-being (indicated by the FAHI scores) was strong positive (r = .747, p = .003). The overall FAHI score explained about half of the variances observed in attendance (r2 = .557, F(1,11)= 13.854, p = .003, Durbin-Watson = 1.528), suggesting the influence of other, currently not tested, factors. The other dependent variables (age, weight, fitness level, CD4 count, flexibility) did not reach the level of significant contribution, set to p = .05 for inclusion, to the prediction model. Of the patients who completed the exercise programme, post measures of all variables were recorded and values were compared to the pre-exercise measures. All measures showed changes in the desired direction (i.e. decrease in weight, chest, waist and hip sizes; and increase in CD4 count, fitness, flexibility, strength and perceived well-being). Of the 5 measures that exhibited significance, the most notable improvements were observed in waist size and strength measures (Table 3). The magnitude of the observed changes did not reach statistical significance in 9 out of 14 measures (at α = 0.05) which may be due to the small sample sizes in some cases. Effect sizes are reported for all measures to inform readers. It is likely that sustained activity (i.e. regular exercise with maintained or increased intensity over a longer period of time) would lead to further improvement in all areas. Very few studies have been reported on the adherence of HIV patients to exercise in the clinical setting. To date, studies in HIV patients have been largely focused on adherence to drug treatment regimes with some studies also reporting the influence of exercise. A recent study by Fillipas et al, reports that 25% of HIV patients failed to meet daily recommended physical activity guidelines . To date, no studies have investigated adherence to physiotherapist-led exercise programmes in HIV patients. Contrary to published controlled trials, this study indicates that adherence to a prescribed and physiotherapistled exercise programme varies greatly in clinical practice with 54.5% of the referred patients choosing to participate and adhere to the freely available exercise programme. Patients in the adherent group scored higher on the overall FAHI scale with higher scores on most subscales which, in line with previous research, indicates that those with better perceived well-being are more likely to show interest in further improvements . However, the fact that perceived well-being explained only about half of the variance in attendance suggests that there are other factors influencing adherence. The association of ethnicity with non-adherence to exercise requires further research. Investigations into body image and stigma for some ethnic groups may relate to weight loss (as one obvious consequence of the exercise programme). Recent psychosocial studies relating to adherence to HIV medical regimens unequivocally suggest that self-efficacy plays an influential role in treatment adherence [52-54]. Future studies should investigate whether self-efficacy contributes to the prediction of exercise adherence. Empirical studies should also investigate psychosocial and physical factors that predict initiation and maintenance of the desired behaviour . For example, Sheeran et al. showed that the Theory of Planned Behaviour (TPB)  predicted the initiation (i.e. turning up for the initial assessment) but not the sustained activity. On the contrary, Conner et al. found that the TPB predicted eating behaviour over a 6-year period. Previous research in this field suggests that the transition from cognition to behaviour is the crucial element. In the TPB framework, Armitage  identified that while sociodemographics and elements of the TPB model have predictive power in most stages of dietary change, they have failed to predict the critical step-change from preparation to action. This crucial stage has yet to be understood to inform intervention. Whilst the timeframe of exercise maintenance can be defined arbitrarily, usually it encompasses behaviour after the first 6 months . Our results show an already high rate of drop-out at the initiation stage with almost 40% of this cohort disengaging during the first weeks, which is in line with the observation made by Armitage during a controlled longitudinal study . The literature is lacking models that address both initiation and maintenance components sufficiently . The 2007 national evaluation of the Local Exercise Action Pilots (LEAP) suffered approximately 90% of data loss owing to the high but not unusual drop-out rate . From a total of 10,433 participants, only 1,051 provided data on both baseline and intervention measures, encompassing time between April 2004 and December 2005. Exercise referral included 460 participants with referral reasons including weight management and disease risk factors. Quantitative and qualitative evaluation offered a cautious positive effect of the exercise referral on behaviour (i.e. progress through physical activity categories), as well as physical and psychological – social well-being. This encouraging evaluation outcome however comes with the caveat that the sample was likely to be affected by self-selection bias and comprised of participants (98.9%) from white British ethnic background. A limitation of our information gathering was that although patients were encouraged to exercise at home independently as well as at the gym sessions we did not collect data on attendance records for this. Further examination of other moderating effects such as different outcome expectations at the onset of and for the maintenance of desirable behaviour; as well as implicit and explicit motivation characteristic to different patient groups is required. Results from such studies will inform healthcare professionals to devise strategies to improve adherence to exercise. As the life expectancy for HIV-positive patients has increased dramatically since the 1990s , in addition to the constantly improving treatment, the quality of life of HIV-positive patients has been receiving increased attention. Exercise has been one of the most popular self-care therapies affording many health benefits and improved well-being, assuming low attrition. A large body of literature has assessed the beneficial effects of exercise adherence in clinical trials, such studies typically use highly motivated volunteers where adherence is automatically assumed and met. The results of this study suggest that adherence to exercise falls well below the desirable level and is indicative that the delivery model of this intervention could be improved. Psychological characteristics appear to differentiate between adherent and non-adherent patients while physical factors do not explain attendance or non-attendance. As ethnic background appears to be an influential factor, following the recommendations of Munro et al. , intervention studies should be devised in relevant socio-economic and psychological environment, which includes addressing adherence in a broad sense: taking up and maintaining the prescribed exercise. Adherence to exercise is an under-researched area with regard to HIV treatment. To address this gap, future studies should include a wider range of psychological assessment, such as explicit and implicit measures of attitude, self-efficacy, intentions and subjective norms in relation to both the goals (i.e. following the prescribed treatment regime) and behaviours (i.e. exercise, taking medication). Further research into reasons for non-adherence as well as for dropouts would be beneficial. Psychotherapy interventions that addressed well-being and self-perceptions could have subsidiary benefits for exercise adherence. In order to gain the most from the exercise, a combined exercise programme including targeted psychological support might be the way forward. A further study is ongoing to investigate the relationship between adherence to exercise and adherence to HAART. KH and GJ collected the data. KH prepared the data set for analyses. AP conducted the data analyses and drafted the paper. DPN contributed to the interpretation of the results and drafting the manuscript. All authors initiated this collaboration and helped to draft and revise the manuscript. All authors read and approved the manuscript. AP is a Reader in Public Health. KH is a Specialist Physiotherapist working in Neurology and HIV. GJ is a Clinical Lead Physiotherapist. DPN is a Professor in Biomolecular Sciences. The authors thank Chris Jukes, Physiotherapist, Guys and St Thomas' for helping with the data collection; Jon Munroe, Technical Instructor and Melissa Irwin, HIV Clinical Specialist Physiotherapist for setting up the exercise programme at Guys and St Thomas' Hospital Trust; Dr Barry S Peters, Reader & Head of Academic Unit, Department of Genitourinary Medicine who leads the Metabolic Clinic and Professor Paschal Sheeran, Department of Psychology, The University of Sheffield. Ammassari A, Trotta MP, Murri R, et al. AdICoNA Study Group. Correlates and predictors of adherence to highly active antiretroviral therapy: overview of published literature J AIDS 2002; 3(S): 123-7. Reynolds NR. Adherence to antiretroviral therapies: state of the science Curr HIV Res 2004; 2: 207-14. Sherr L, Lampe F, Norwood S, et al. Adherence to antiretroviral treatment in patients with HIV in the UK: a study of complexity AIDS Care 2008; 20: 442-8. Fogarty L, Roter D, Larson S, Burke J, Gillespie J, Levy R. Patient adherence to HIV medication regimens. A review of published and abstract reports Patient Educ Counsel 2002; 46: 93-108. Stirrat MJ, Gordon CM. HIV treatment adherence research and intervention: current advances and future challenges J HIV AIDS Soc Serv 2007; 1/2: 9-22. Falagas ME, Zarkadoulia EA, Pliatsika PA, Panos G. Socioeconomic status (SES) as a determinant of adherence to treatment in HIV infected patients: a systematic review of the literature Retrovirology 2008; 5: 13. Gao X, Nau DP, Rosenbluth SA, Scott V, Woodward C. The relationship of disease severity, health beliefs and medication adherence among HIV patients AIDS Care 2000; 12: 387-98. Carballo E, Cadarso-Suárez C, Carrera I, et al. Assessing relationships between health-related quality of life and adherence to antiretroviral therapy Qual Life Res 2004; 13: 587-99. Reynolds NR, Testa MA, Marc LG, et al. Protocol Teams of ACTG 384, ACTG 731, A5031s. Factors influencing medication adherence beliefs and self-efficacy in persons naive to antiretroviral therapy: a multicenter, cross-sectional study AIDS Behav 2004; 8: 141-50. Johnson MO, Charlebois E, Morin SF, Remien RH, Chesney MA. National Institute of Mental Health Healthy Living Project Team. Effects of a behavioural intervention on antiretroviral medication adherence among people living with HIV: the healthy living project randomized controlled study J Acquir Immune Defic Syndr 2007; 46: 574-80. Munro S, Lewin S, Swart T, Volmink J. A review of health behaviour theories: how useful are these for developing interventions to promote long-term medication adherence for TB and HIV/AIDS? BMC Public Health 2007; 7: 104. Simoni JM, Pearson CR, Pantalone DW, Marks G, Crepaz N. Efficacy of interventions in improving highly active antiretroviral therapy adherence and HIV-1 RNA viral load. A meta-analytic review of randomized controlled trials J Acquir Immune Defic Syndr 2006; 43: S23-35. Strathdee SA, Patterson TL. Behavioral interventions for HIV-positive and HCV-positive drug users AIDS Behav 2006; 10: 115-30. Chang BH, Boehmer U, Zhao Y, Sommers E. The combined effect of relaxation response and acupuncture on quality of life in HIV patients J Altern Complement Med 2007; 13: 719-24. Littlewood RA, Vanabe PA. Complementary and alternative medicine use among HIV-positive people: research synthesis and implications for HIV care AIDS Care 2008; 20: 1002-8. Carrico AW, Antoni MH. Effects of psychological interventions on neuroendocrine hormone regulation and immune status in HIV-positive persons: a review of randomized controlled trials Psychosom Med 2008; 70: 575-84. Taylor NF, Dodd KJ, Shields N, Bruder A. Therapeutic exercise in physiotherapy practice is beneficial: a summary of systematic reviews 2002-2005 Aust J Physiother 2007; 53: 7-16. O’Brien K, Tynan A-M, Nixon S, Glazier RH. Effects of progressive resistive exercise in adults living with HIV/AIDS: systemic review and meta-analysis of randomized trials AIDS Care 2008; 20: 631-53. O’Brien K, Nixon S, Tynan A-M, Glazier RH. Effectiveness of aerobic exercise in adults living with HIV/AIDS: systemic review Med Sci Sport Exerc 2004; 36: 1659-66. Hand GA, Phillips KD, Dudgeon WD, Lyerly GW, Durstine JL, Burgess SE. Moderate intensity exercise training reverses functional aerobic impairment in HIV-infected individuals AIDS Care 2008; 20: 1066-74. Mutimura E, Stewart A, Crowther NJ, Yarasheski KE, Cade WT. The effects of exercise training on quality of life in HAART-treated HIV-positive Rwandan subjects with body fat distribution Qual Life Res 2008; 17: 377-85. Spierer DK, DeMeersman RE, Kleinfeld J, et al. Exercise training improves cardiovascular and autonomic profiles in HIV Clin Auton Res 2007; 17: 341-8. Driscoll SD, Meininger GE, Lareau MT, et al. Effects of exercise training and metformin on body composition and cardiovascular indices in HIV-infected patients AIDS 2004; 18: 465-73. Agin D, Gallagher D, Wang J, Heymsfield SB, Pierson RN, Kotler DP. Effects of whey protein and resistance exercise on body cell mass, muscle strength, and quality of life in women with HIV AIDS 2001; 15: 2431-40. Smith BA, Neidig JL, Nickel JT, Mitchell GL, Para MF, Fass RJ. Aerobic exercise: effects on parameters related to fatigue, dyspnea, weight and body composition in HIV-infected adults AIDS 2001; 15: 603-701. Perna FM, LaPerriere A, Klimas N, et al. Cardiopulmonary and CD4 cell changes in response to exercise training in early symptomatic HIV infection Med Sci Sport Exerc 1999; 31: 973-. Ciccolo JT, Jowers EM, Bartholomew JB. The benefits of exercise training for quality of life in HIV/AIDS in the post-HAART era Sport Med 2004; 34: 487-99. Amico KR, Harman JJ, Johnson BT. Efficacy of antiretroviral therapy adherence interventions: a research synthesis of trials, 1996 to 2004 J Acquir Immune Defic Syndr 2006; 41: 285-97. Cote JK, Godin G. Efficacy of interventions in improving adherence to antiretroviral therapy Int J STD AIDS 2005; 16: 335-43. Gonzalez JS, Penedo FJ, Antoni MH, et al. Social support, positive states of mind, and HIV treatment adherence in men and women living with HIV/AIDS Health Psychol 2004; 23: 413-8. Kalichman SC. Co-occurrence of treatment nonadherence and continued HIV transmission risk behaviors: implications for positive prevention interventions Psychosom Med 2008; 70: 593-7. Thompson RI, Bidgood P, Petroczi A, Denholm-Price JCW, Fielder MD. An alternative methodology for the prediction of adherence to anti HIV treatment AIDS Res Ther 2009; 6: 9. Myers LB, Horn SA. Adherence to chest physiotherapy in adults with cystic fibrosis Health Psychol 2006; 11: 915-26. Barbour KA, Miller NH. Adherence to exercise training in heart failure: a review Heart Fail Rev 2008; 13: 81-9. Swärdh E, Biguet G, Opava CH. Views on exercise maintenance variations among patients with rheumatoid arthritis Phys Ther 2008; 88: 1049. Mailloux J, Finno M, Rainville J. Long-term exercise adherence in the elderly with chronic low back pain Am J Phys Med Rehabil 2006; 85: 120-6. American College of Sports Medicine: Guidelines for Exercise Testing and Prescription. 6th. Baltimore: Williams and Wilkins 2000. Fillipas S, Oldmeadow LB, Bailey MJ, Cherry CL. A six-month, supervised, aerobic and resistance exercise program improves self-efficacy in people with human immunodeficiency virus: a randomised controlled trial Aust J Physiother 2006; 52: 185-92. Peterman AH, Cella D, Mo F, McCain N. Psychometric validation of the revised Functional Assessment of Human Immunodeficiency Virus Infection (FAHI) quality of life instrument Qual Life Res 1997; 6: 572-84. Armitage CJ. Can the theory of planned behavior predict the maintenance of physical activity? Health Psychol 2005; 24: 235-45. Mutimura E, Crowther NJ, Cade TW, Yarasheski KE, Stewart A. Exercise training reduces central adiposity and improves metabolic indices in HAART-treated HIV-positive subjects in Rwanda: a randomized controlled trial AIDS Res Human Retroviruses 2008; 24: 15-23. Nixon S, O’Brien K, Glazier RH, Tynan AM. Aerobic exercise interventions for adults living with HIV/AIDS Cochrane Database Syst Rev 2005; 18: CD001796. O'Brien K, Tynan AM, Nixon S, Glazier RH. Effects of progressive resistive exercise in adults living with HIV/AIDS: systematic review and meta-analysis of randomized trials AIDS Care 2008; 20: 631-53. Rhodes RE, Warburton DER, Murray H. Characteristics of physical activity guidelines and their effect on adherence: a review of randomized trials Sports Med 2009; 39: 355-75. Faul F, Erdfelder E, Lang AG, Buchner A. G*Power 3: A flexible statistical power analysis program for the social, behavioral, and biomedical sciences Behav Res Methods 2007; 39: 175-91. Fillipas S, Bowtell-Harris CA, Oldmeadow LB, Cicuttini F, Holland AE, Cherry CL. Physical activity uptake in patients with HIV: who does how much? Int J STD AIDS 2008; 19: 514-8. Clingerman E. Physical activity, social support, and health-related quality of life among persons with HIV disease J Commun Health Nurs 2004; 21: 179-97. Reynolds NR, Testa MA, Marc LG, et al. Factors influencing medication adherence beliefs and self-efficacy in persons naïve to antiretroviral therapy: a multicenter, cross-sectional study AIDS Behav 2004; 8: 141-50. DiIorio C, McCarty F, DePadilla L, et al. Adherence to antiretroviral medication regimens: a test of a psychosocial model AIDS Behav 2009; 13: 10-22. Johnson MO, Neilands TB, Dilworth SE, Morin SF, Remien RH, Chesney MA. The role of self-efficacy in HIV treatment adherence: validation of the treatment adherence self-efficacy scale (HIV-ASES) J Behav Med 2007; 30: 359-70. Norman P, Conner M. Predicting and changing health behaviour: future directions In: Conner M, Norman P, Eds. Predicting health behaviour: research and practice with social cognition models. 2nd. McGraw-Hill: Maidenhead Open University Press 2008; pp. 324-71. Sheeran P, Conner M, Norman P. Can the theory of planned behavior explain patterns of health behavior change? Health Psychol 2001; 20: 12-9. Ajzen I. The theory of planned behaviour Org Behav Hum Decis Processes 1991; 50: 179-211. Conner M, Norman P, Bell R. The theory of planned behaviour and healthy eating Health Psychol 2002; 21: 194-201. Armitage CJ. Evidence that implementation intention reduce dietary fat intake: a randomized trial Health Psychol 2004; 23: 319-23. Carnegie research Institute. Leeds Metropolitan University with Matrix RCL & Ipsos MORI: The national evaluation of LEAP In: Final report on the national evaluation of the Local Exercise Action Pilots. London: Prepared for the Department of Health, Countryside Agency and Sport England 2007. The Antiretroviral Therapy Cohort Collaboration. Life expectancy of individuals on combination antiretroviral therapy in high-income countries: a collaborative analysis of 14 cohort studies Lancet 2008; 372: 293-9.